This month's issue of the TRRF e-Newsletter focuses on the celebrated yet controversial work of pictorialist Hollywood photographer, William H. Mortensen. 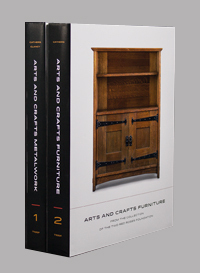 TRRF also announces its latest and soon to be released manuscript, So Various Are The Forms It Assumes, Arts and Crafts Furniture From The Collection of the Two Red Roses Foundation, by David Cathers. The Two Red Roses Foundation has recently acquired several vintage original prints by William Mortensen and an extensive collection of his books, pamphlets, magazines, exhibition catalogs and ephemera. (click here for a complete list). Notable in this collection is "The Seven Ages of Woman", an extremely rare and self-published 1927 book, signed, and composed of 8 original photogravures, numbered in ink (on the flyleaf) '16' of an edition of 20. 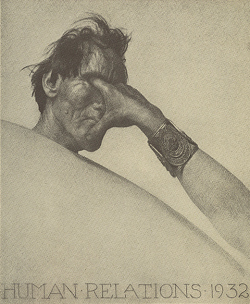 Click here to view the photogravures contained in the book. Another extremely rare and possibly unique book is the 1936 first edition of Monsters and Madonnas with its original thin paper dust wrapper and shipping carton as well as a paper negative by Mortensen. William Herbert Mortensen was born on January 27, 1897 in Park City, Utah, the son of Danish immigrants, Agnes and William Peter Mortensen. After his discharge from the army, Mortensen studied illustration at the Art Students League in New York City. In May 1920, Mortensen traveled abroad to Greece, Italy, Egypt and Constantinople to "sketch for educational purposes". He later returned to Utah, then moved to California in the late 20's. Mortensen began his photographic career taking portraits of many of Hollywood's most famous personalities, working with such acclaimed figures as Fay Wray, Cecil B. deMille, Vincent Price, Jean Harlow and Marlene Dietrich. In 1931, he moved to the artist community of Laguna Beach, California where he opened a studio and the legendary William Mortensen School of Photography. In addition to being an active and successful Hollywood portrait photographer, Mortensen also embarked on a prolific writing career in the late 1920's creating nine books devoted to teaching and instructing photographers on the unique techniques he had developed over the years. Monsters and Madonnas is recognized as one of his most popular "how to" publications. While his "pictorialist" style of photography relied on painterly soft-focus and darkroom techniques to produce lavishly toned prints he found himself at odds with the new "purist" movement in fine arts photography. His compositions and subject matter were steeped in Gothic traditions often theatrical, strange, grotesque and bizarre. The new movement, which valued the pure unadorned print, and a more documentarian style, was gaining popularity among a growing following of important photographers and found no place for the Gothic-inspired Mortensen. In fact, Mortensen became the focus of a well-documented and rancorous feud with Ansel Adams, one of the founders of the f/64 group. So much so that Adams referred to Mortensen as the "devil" and the "anti-Christ". For the f/64 group it was not enough to simply disagree with Mortensen"s pictorialism , it became personal. Adams and others from f/64 are responsible for the absence of Mortensen in discussions of important photographers of the time. 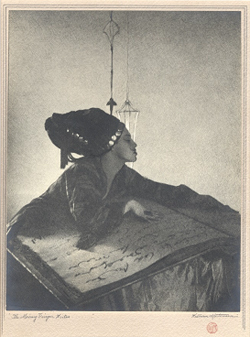 Rejected by modernists as hopelessly retrograde, Mortensen steadfastly practiced pictorialist techniques for the duration of his career, maintaining Steichen's position of twenty years earlier – that "frank artifice in photographs is the key to their success as works of art". "William Mortensen: Photographic Master at the Monster's Ball"
"The Grotesque Eroticism Of William Mortensen's Lost Photography"
"Monsters and Madonnas: Looking at William Mortensen"
After nearly four years in the making the TRRF's furniture collection's catalog So Various Are The Forms It Assumes, Arts and Crafts Furniture From The Collection of the Two Red Roses is expected to arrive from the printer by late October. This project is the combined effort of noted author David Cathers, generally regarded as the foremost authority on Gustav Stickley and Mission furniture in the US, Alex Vertikoff, renowned photographer whose images of Arts and Crafts homes and interiors have appeared in books and magazines dedicated to the period, and Marquand Books a recognized leader in the production of museum art manuscripts and catalogs. The manuscript will retail for $60 and will be available exclusively from eBay and from our website. 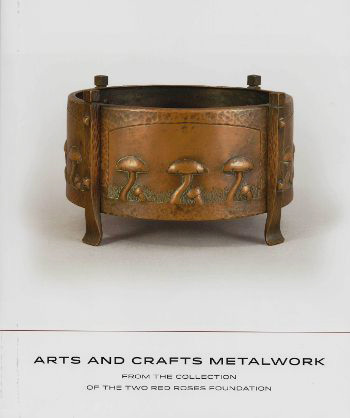 You may purchase the manuscript Arts and Crafts Metalwork from the Collection of the Two Red Roses Foundation as well as other exhibit catalogs and collection books from the Two Red Roses Foundation website or from . We do not process credit card payments. You may utilize Paypal, who will process your credit card payment without having to hold a Paypal account, or simply mail a check to our address below and we'll be happy to ship your purchase promptly.